Upgradation of PETs as SAs/School Assistants(Physical Education) in Telangana. 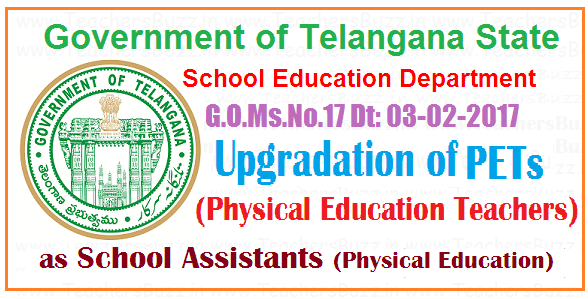 Upgradation of PETs as SAs/School Assistants(Physical Education)in Telangana Schools GO. 17. PETs upgraded are as SA(Physical Education) in TS High Schools. 1047 PET Posts are Upgraded to SAs, Upgradation of PET posts as SA(Physical Education) in TS High Schools, Upgradation of Physical Education Teachers as School Assistants(Physical Education) in High Schools, Upgradation of PETs as SAs in Telangana State. Telangana Government accord sanctioned for the upgradation of 2487 Language Pandits as School Assistants (Languages) and also upgradation of 1047 Physical Education Teacher (PET) posts as School Assistants (Physical Education) in the State by suppressing 392 surplus vacant posts Secondary Grade Teacher (SGT). SCHOOL EDUCATION DEPARTMENT, Upgradation of 2487 Language Pandits as School Assistants (Languages) and 1047 Physical Education Teacher (PET) posts as School Assistants (Physical Education) in the State–Orders - Issued. 3. CMP No.519/CMP-MM/2016, dt.01.11.2016 enclosing the letter of Sri Katepalli Janardhan Reddy, MLC, dt.01.11.2016. 2. In the references 2nd read above, the Director of School Education, TS., Hyderabad has submitted the proposals for upgradation of 2487 Language Pandit posts to that of School Assistants (Languages) and another 1047 Physical Education Teacher (PET) posts as School Assistants (Physical Education) in the State, based on the latest enrolment as on 30.06.2016 and as per the rationalization norms issued in G.O.Ms.No.11, School E ducation (Services-II) Department, dt.15.06.2015, by taking into account minimum enrolment of 220 Students in the High Schools. He has also submitted the financial commitment for the upgradation of 2487 Language Pandit posts as School Assistants (Languages) as Rs.8.44 Crores and for the upgradation of 1047 PET posts as School Assistants (Physical Education) as Rs.3.55 Crores i.e., total Rs.11.99 Crores. He has also worked out the surplus vacant SGT posts required to be suppressed and proposed that 392 SGT surplus vacant posts can be suppressed in order to upgrade 2487 Language Pandit posts to that of School Assistants (Languages) and another 1047 Physical Education Teachers (PET) posts as School Assistants (Physical Education) in the State. 4. After careful examination of the proposal, Government hereby accord sanction for the upgradation of 2487 Language Pandits as School Assistants (Languages) and also upgradation of 1047 Physical Education Teacher (PET) posts as School Assistants (Physical Education) in the State by suppressing 392 surplus vacant posts Secondary Grade Teacher (SGT). SCHOOL EDUCATION DEPARTMENT – Upgradation of 2487 Language Pandits as School Assistants (Languages) and 1047 Physical Education Teacher (PET) posts as School Assistants (Physical Education) in the State–Amendment - Orders - Issued. 5. G.O.Ms.No.17, Finance (HRM-II) Department, Dt.03-02-2017. After careful examination of the proposal, Government hereby accord sanction for the upgradation of 2487 Language Pandits as School Assistants (Languages)by absorbing the existing Language Pandits as School Assistants (Languages) as per their seniority and eligibility in terms of G.O.Ms.No.11 and 12, School Education (Services-II) Department, dt.23-01-2009 and also hereby accord sanction for the upgradation of 1047 Physical Education Teacher (PET) posts as School Assistants (Physical Education) in the State by suppressing 392 surplus vacant posts of Secondary Grade Teachers (SGT). Upgradation of PETs as SAs/School Assistants(Physical Education) in TS amendment GO.18.